If you like animals, this blog series is for you. After 43 days in Panamá, it’s time to go over some of the fauna that I’ve had the chance to encounter. I begin today with birds, just for you feather-lovers. More animal groups will follow. Expect reading and lots of pictures. If you want to check out more pictures, well that’s why I have a flickr account. Go nuts with it. Most of the birds covered here were spotted at the Chagres National Park, the Metropolitan Natural Park and at the heart of Panamá City. Of course, these are only those that I managed to photograph and for which the photos are decent enough to be published. You just try to photograph birds when your camera gets all fogged up every 5 minutes. But before I put up an overload of pictures, an introduction might be useful. 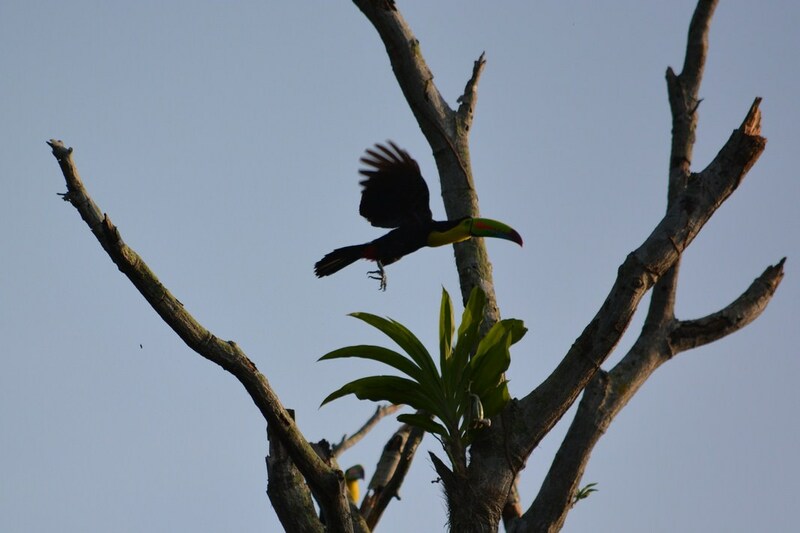 Birds are extremely abundant in Panamá. Of all the vertebrates, they are clearly those the average tourist will see the most. Panamá is the natural land bridge between North and South America. Some of Panamanian resident birds are therefore natives of the Amazon rainforest, and Panamá just happens to be the northernmost part of their distribution. Alternatively, many North American birds will live yearlong as south as Panamá, without crossing into Colombia. So Panamá has representatives of both Northern birds and Southern birds. Its diversity is also explained by the diversity of habitats in the country. Although Panamá is a small country, the Atlantic and Pacific coasts have radically different climates. The Pacific side has a very pronounced dry season, and a pronounced wet season. On this side, a good number of the trees actually shed their leaves in the dry season to prevent desiccation. The Caribbean side is different. There is a dry season, but it is nowhere as dry as that of the South side, and few trees shed their leaves at any time of the year. Both types of forests are classified as tropical rainforests (more precisely moist semi-evergreen seasonal forests). In the middle, there are mountains, with habitats changing as you climb in altitude and generally covered by mountain rain forests and cloud forests. Of course, one should not forget that the country is bordered by two oceans. It has freshwater marshes and swamps, mangroves, coral reefs, etc. Basically, the country is small, but it still has a good diversity of habitats. That’s for resident birds. Most of you know that a lot of birds migrate to avoid winter. Well when we freeze to death in Montreal, many of our birds migrate south. 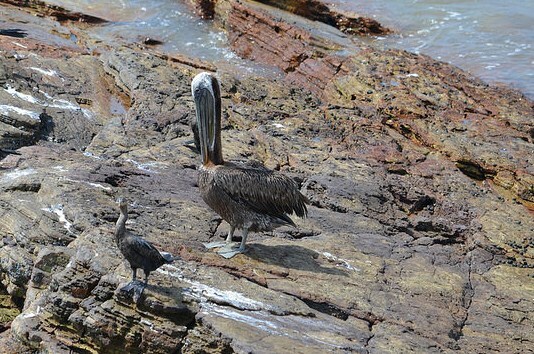 The lazy ones stop in Mexico, but many species come as far as Panamá. One might ask, when it’s winter in Argentina and Chile (which happens to be the case right now), what happens then? You guessed right, those birds also end up in Panamá. As a result, bird diversity is ridiculously high in this country. Panamá is just about the size of New Brunswick (or South Carolina for you Americans, or between Ireland and Austria for you Europeans). Yet, as of 2010, 978 species had been recorded. That’s more than in all of Canada and the United States combined! That’s indeed astounding diversity. But enough with the theory, let’s start. Panamá having a lot of water, a lot of birds are adapted for it. There is a high diversity of ibises, egrets, herons, sandpipers, boobies and other shore-oriented birds. For now, most of those I saw were around the fish market (why go fishing when you can empty the garbage). A Brown Pelican (Pelecanus occidentalis) cleans its feathers by the fish market in the old part of Panamá City, Casco Viejo (Photo: Nicolas Chatel-Launay). 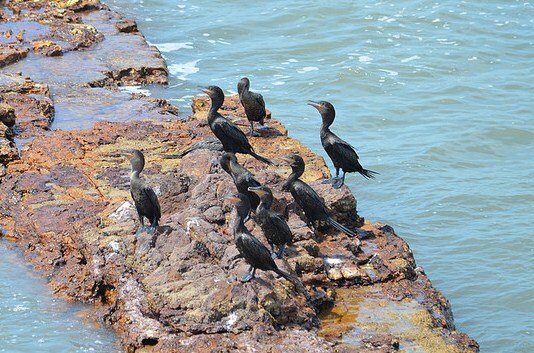 Neotropic Cormorants (Phalacrocorax brasilianus) just finished drying their feathers in Casco Viejo (Photo: Nicolas Chatel-Launay). Another group that is ubiquitous in the city itself is… vultures. All those garbage landfills certainly attract a lot of them. 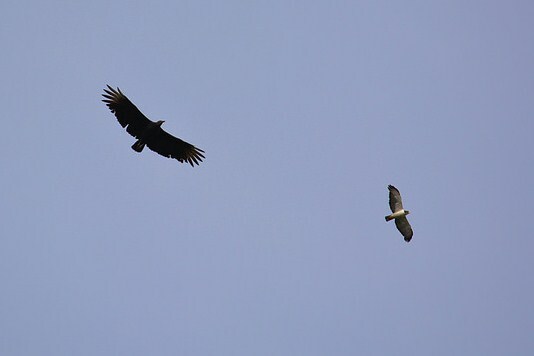 There’s a continuous cloud of vultures over Panamá City, often accompanied by some birds of prey. Of course other birds of prey are far more difficult to see. Among them is the Harpy Eagle (Harpia harpyja), the emblem of Panamá. It does live in Chagres National Park, but knowing it’s there, and actually seeing it are two very different things. In the early morning, hoards of vultures soar off from the Metropolitan Park or from Ancón Hill. This Black Vulture (Coragyps atratus) left from the Metropolitan Park. The identity of the accompanying raptor is less clear. My best guess is the pale morph of the Short-Tailed Hawk (Buteo brachyurus). If you have a better idea, feel free to correct me (Photo: Nicolas Chatel-Launay). 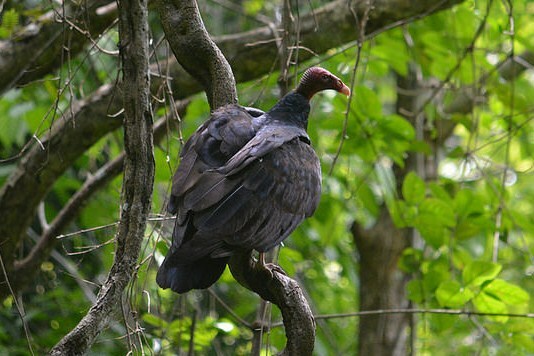 The Turkey Vulture (Cathartes aura) is one of the birds that can live in Québec just as well as in Panamá. 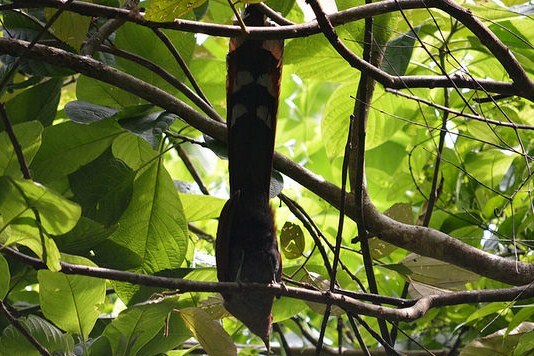 This one was hanging out in Chagres National Park (Photo: Nicolas Chatel-Launay). Have you ever heard of cuckoos? Yes, those birds that lay eggs in the nest of other species and who’s baby will kick out foster siblings in order to get all the attention of its foster parents. Well they are fairly diverse in Panamá. My best guess for that one is the Squirrel Cuckoo (Piaya cayana), but I could be mistaken (Photo: Nicolas Chatel-Launay). Of all the birds of Panamá, hummingbirds form one of the most iconic and diverse groups. They are all gorgeous. But they are tiny and they move really fast. So sadly, I have no pictures for you. Eventually, I’ll insert one of the 59 species that can be found in Panamá into another blog post. I know! Having no hummingbird-related picture would not do. So here’s a nest in the Darién province. 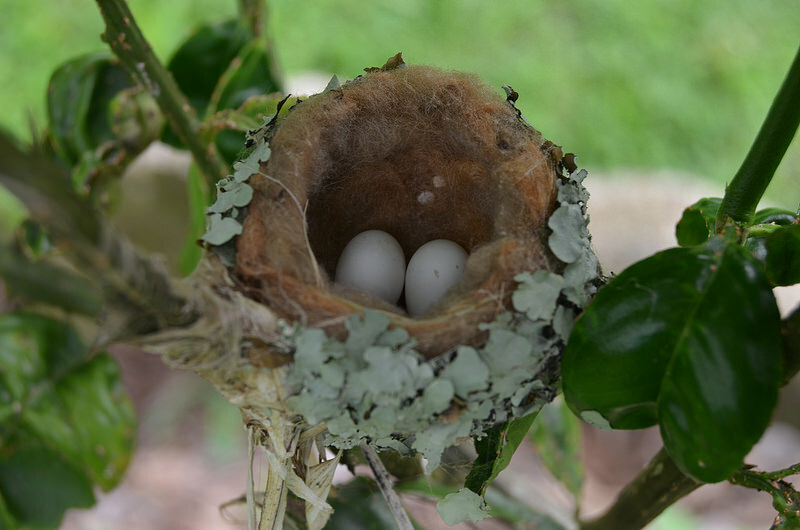 How do I know it’s a hummingbird’s nest? Well if a standard shooter glass would not fit in the nest, it’s from a hummingbird (Photo: Nicolas Chatel-Launay). Trogons are another iconic group, or at least, one species is. Everyone has heard of the famous Resplendent Quetzal (Pharomachrus mocinno). If you haven’t, google it. Sadly, quetzals are extremely rare in Panamá, Costa Rica wins that one. But the group is still very diverse South of the border. 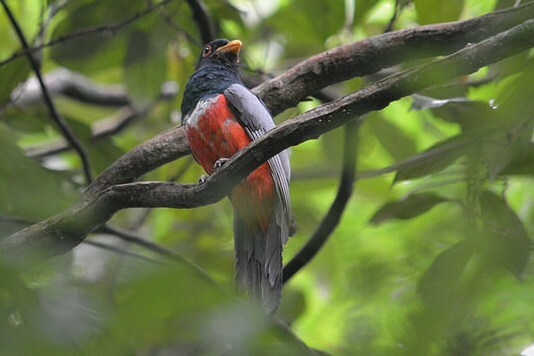 Trogons feed off fruits and insects and are often described as… lethargic. Apart from having beauty sleeps, they don’t do much. This beautiful female Slaty-Tailed Trogon (Trogon massena) was not moving much, which is great for photography. To give you an idea of size, this species measures just over 30 cm (Photo: Nicolas Chatel-Launay). One bird group every tourist in their right mind wants to see is… parrots. Well, sorry to break your heart, but if you lie down on the beach all day, you won’t. Parrots and parakeets all live in trees. Trees have green leaves. In Panamá, parrots are mostly… green. On top of it, they don’t do much during the day, and most of them only sing when they are flying. Therefore, there are only two ways of seeing parrots. Get out there at dawn (yup, 6:30 is already late), or at dusk (yup, mosquitoes galore). At these times, parrots are flying around. Of course, this means you don’t have enough light to take pictures. And if you augment the exposure time, well the birds are airborne, so you will get a lovely picture of a blurry green line. The second option is to stand under a mango tree. It works. But of course, that will be when your camera decides to fog up (humidity is over 85% every single day). All this was meant to justify why I have seen tons of parrots, but only have one picture to prove it. The Red-Lored Parrot (Amazona autumnalis) is ubiquitous in Panamá. If you are outside at dawn or dusk, you will see or hear one virtually every day. This specimen was flying at 6:40 am in the middle of Panamá City (Photo: Nicolas Chatel-Launay). In real life, most birds are not parrots. Most birds are actually rather small; they eat a variety of things including insects. For real birders, they are still quite interesting to watch. Here’s a small selection. 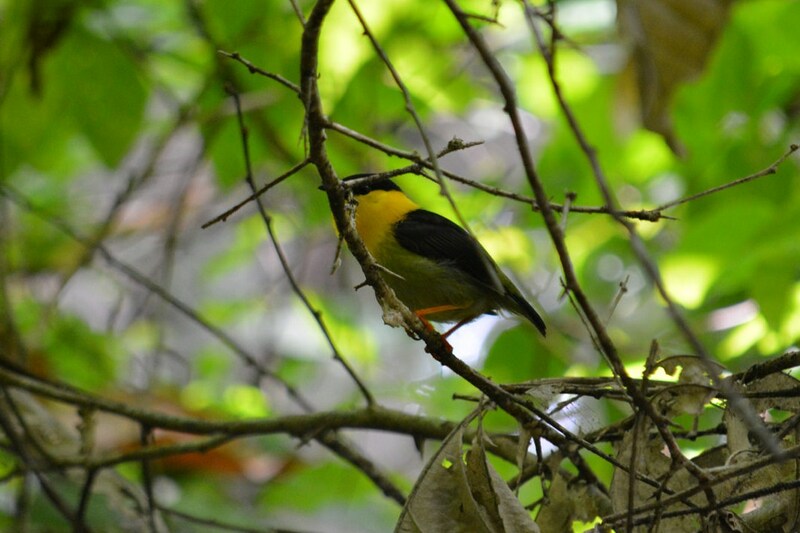 Meet a male Golden-Collared Manakin (Manacus vitellinus) from Chagres National Park. Manakins live in the understory of tropical forests and feed on fruits. They are mostly discreet. However, there is no way you can miss that one during mating season. The male courts the female by singing hysterically while snapping its wings together! That snapping noise is almost identical to that of a line of firecrackers. It can make you jump when you’re not ready for it, trust me (Photo Nicolas Chatel-Launay). Tanagers are extremely diverse and common here. They eat insects and fruits. 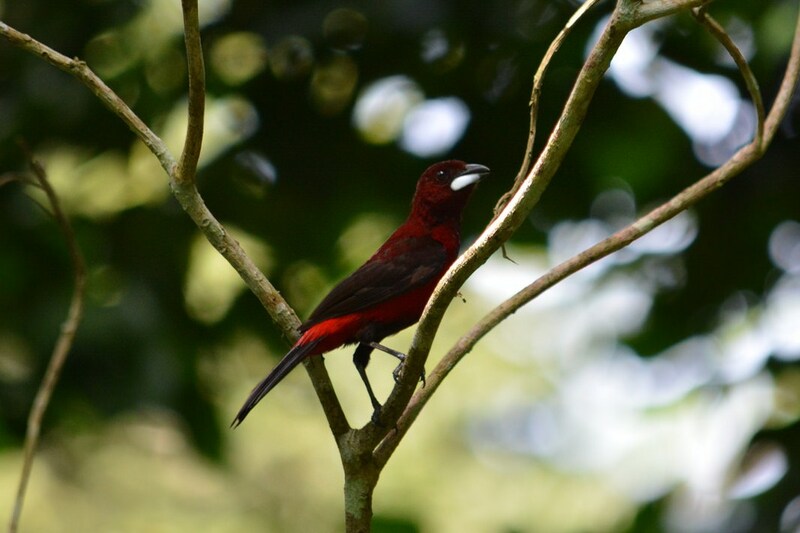 This one is a Crimson-Backed Tanager (Ramphocelus dimidiatus) from the Metropolitan Park (Photo: Nicolas Chatel-Launay). 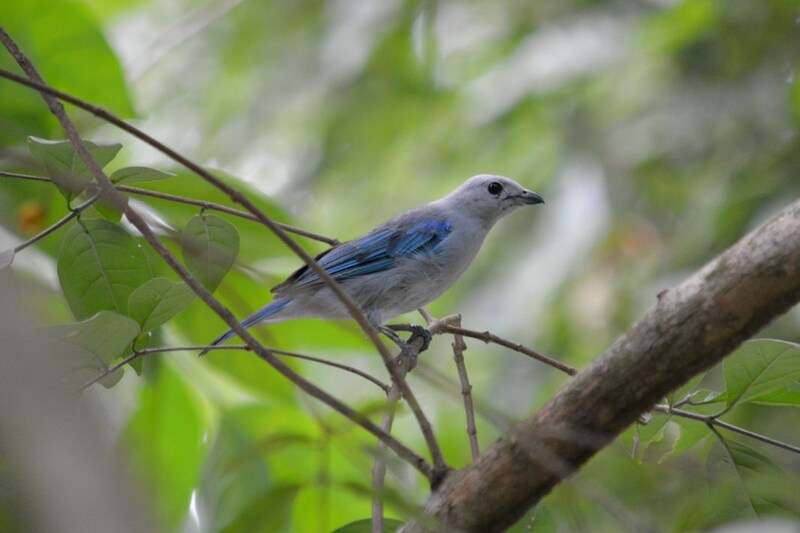 Another common tanager is the Blue-Gray Tanager (Thraupis episcopus) caught just behind my apartment (Photo: Nicolas Chatel-Launay). 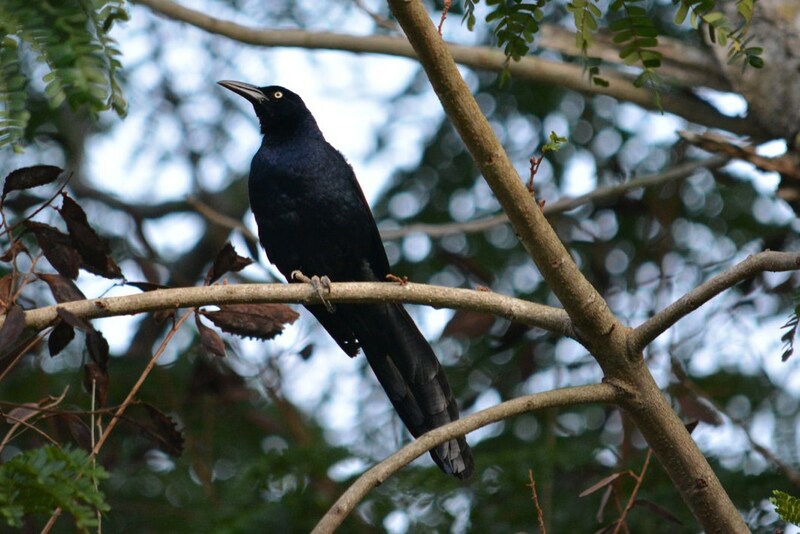 The Great-Tailed Grackle (Quiscalus mexicanus) is probably the biggest bird (apart from vultures) than can be observed readily everywhere and at any time of the day (Photo: Nicolas Chatel-Launay). Don’t worry, I left the best for last. 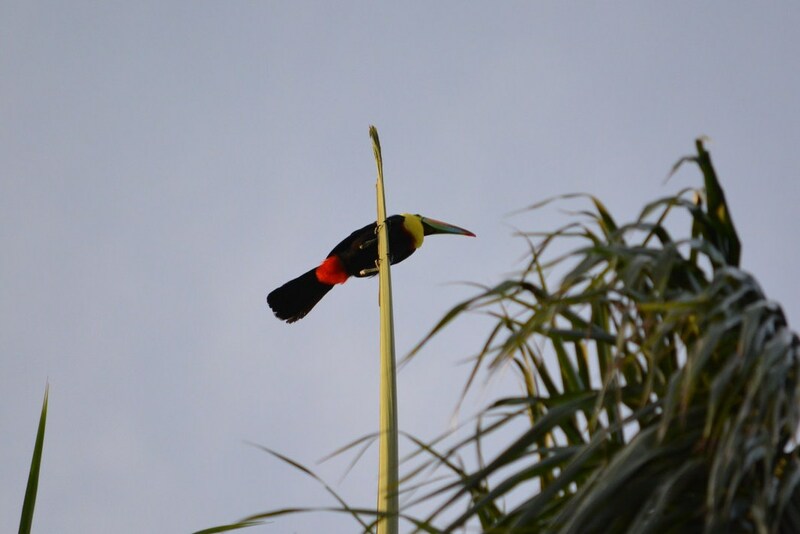 Everyone loves toucans. 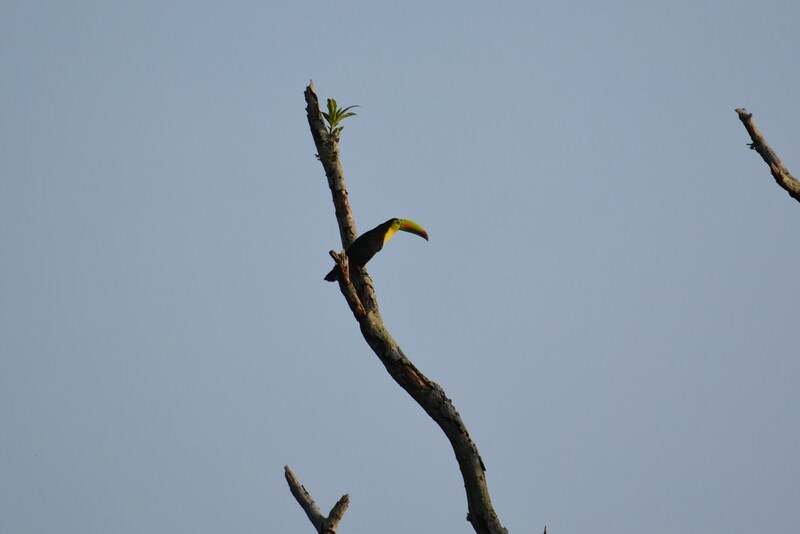 Toucans are fruit lovers, although they will eat an insect or a lizard if they get the chance. These birds are huge (some species reach 50 cm), beautiful, and very playful. In the early morning, they really move around a lot while pecking at wood, singing, playing with each other. They are just adorable. Guess what, five of them live behind the apartment! A group of five Keel-Billed Toucans (Ramphastos sulfuratus) live behind the apartment in Panamá City. They measure just over 45 cm. One must go outside before 7:00 am to see them, but it is totally worth it (Photos: Nicolas Chatel-Launay). I would like to conclude by giving special thanks to Dr. George R. Angehr (I actually met him yesterday at the Smithsonian) and Robert Dean for having published “The Birds of Panama, A Field Guide”. Let’s just say that I rarely fall on a bird guide that I can use reliably.